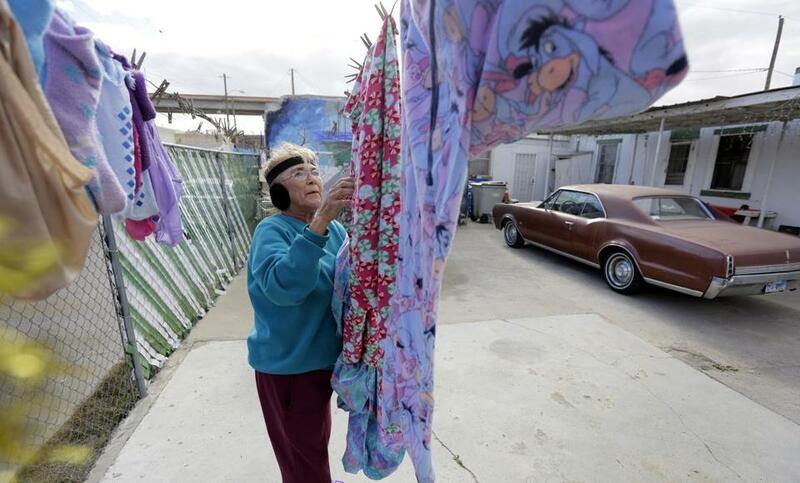 Mickie Subia gathered her laundry last month at her home in El Paso. Subia lives less than a block away from a barrier that runs along the Texas-Mexico border. EL PASO — People walking over the Paso del Norte Bridge linking this West Texas border city to Mexico can watch President Trump’s border wall getting bigger in real time. Workers in fluorescent smocks can be seen digging trenches, pouring concrete, and erecting rust-colored slabs of 18-foot-high metal to replace layers of barbed-wire-topped fencing along the mud-colored Rio Grande, which is usually little more than a trickle. In his State of the Union address, the president said a ‘‘powerful barrier’’ had cut crime rates in El Paso. He will hold a rally in the city Monday to show why he’s demanding more than 100 miles of new walls, costing $5.7 billion, along the 1,900-mile border, despite opposition from Democrats and some Republicans in Congress. But many in this city of dusty desert winds and blistering salsa bristle at the prospect of their home becoming a border wall poster child. ‘‘The richest of the rich, the poorest of the poor, we all have different reasons for wanting to cross, and people cross every day,’’ said El Paso City Council member Peter Svarzbein. O’Rourke will help lead a Monday evening march opposing the wall with dozens of local civic, human rights, and Hispanic groups at the same time Trump is holding his rally. ‘‘While some try to stoke fear and paranoia, to spread lies and a false narrative about the US-Mexico border and to demand a 2,000-mile wall along it at a time of record safety and security, El Paso will come together for a march and celebration that highlights the truth,’’ O’Rourke said in a statement. For centuries, virtually nothing but an often tranquil Rio Grande stood between the city and Juarez. But worsening economic problems in Mexico increased the flow of immigrants into the United States in the 1970s, prompting Congress to approved chain-link fencing here and in San Diego dubbed the ‘‘Tortilla Curtain.’’ More barriers were added in the 1990s and 2006. ‘‘There are regular shootouts near the border, dangerous narcotics trafficked,’’ said recently elected Republican Chip Roy, a congressman who represents a district between Austin and San Antonio. ‘‘The good news is that we can stop this,’’ Roy said in a post-State of the Union fund-raising e-mail championing a Trump-backed wall. The FBI’s Uniform Crime Report shows that El Paso’s annual number of reported violent crimes dropped from nearly 5,000 in 1995 to around 2,700 in 2016. But that corresponded to similar declines in violent crime nationwide and included times when the city’s crime rates actually increased year over year, despite new fencing and walls. The Trump administration was moving on its own to fortify the southwestern border with thousands of active-duty military troops, The New York Times reported. The number of deployed troops on the Mexican border was set to exceed the high of 5,900 reached around the November elections.